Samsung this week introduced its new 10.5-inch Google Android-based tablet. 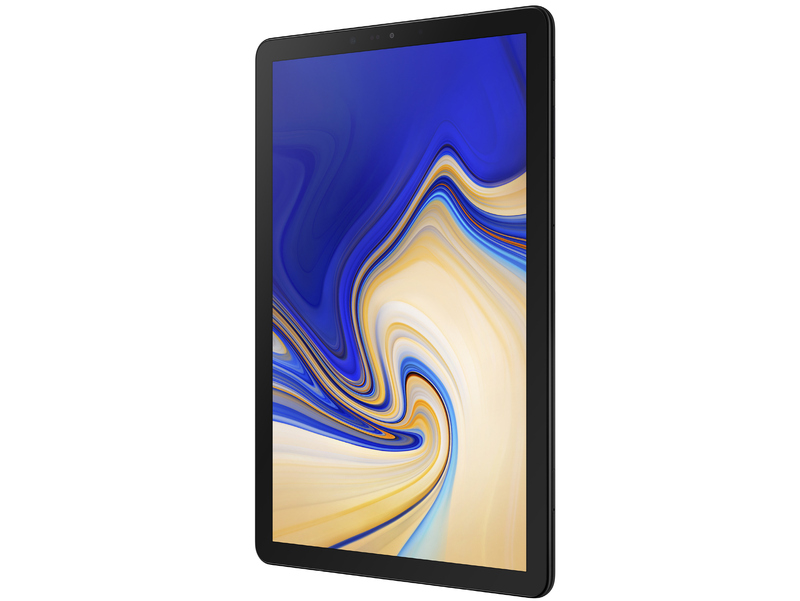 The new Galaxy Tab S4 uses Qualcomm’s high-performance mobile SoC, is outfitted with a premium sAMOLED display, and an advanced audio subsystem with the Dolby Atmos badge to satisfy users looking forward mobile entertainment. In addition, the Galaxy Tab S4 now supports Samsung’s DeX platform that enables to run productivity applications on desktop displays as well as Samsung’s Knox security platform. The Samsung Galaxy Tab S4 is based on the Qualcomm Snapdragon 835 SoC (four Kryo 385 Gold cores, four Kryo 385 Silver cores, Adreno 540 iGPU, 64-bit LPDDR4X memory, etc.) that is equipped with 4 GB of RAM, and 64 or 256 GB of NAND flash storage (expandable by 400 GB using a microSDXC card). The tablet has a 10.5-inch Super AMOLED display with a 2560×1600 resolution, which is a bit larger than the monitor used on the Galaxy Tab S3. As for imaging capabilities, the device has a 13 MP rear sensor as well as an 8 MP front sensor, both equipped with a flash. 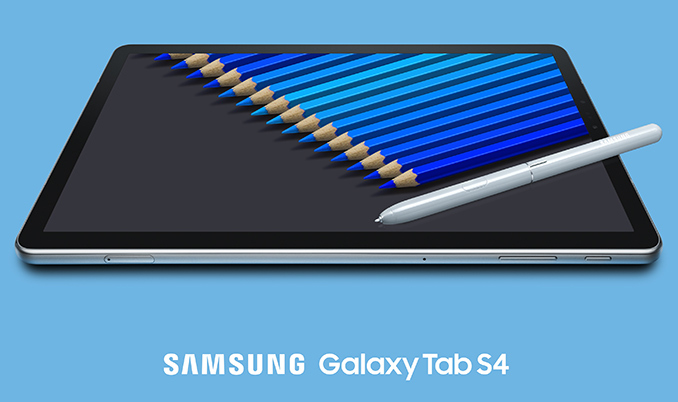 Wireless connectivity features of the Galaxy Tab S4 include a 4G/LTE Cat. 16 modem (on select SKUs), a 802.11ac Wi-Fi controller with MIMO support, and Bluetooth 5.0. Wired I/O includes POGO contacts for keyboards as well as a USB Type-C connector for various peripherals. In addition, the tablet has a whole set of sensors people come to expect from this type of products, including an accelerometer, a compass, a gyroscope, a proximity sensor, an iris scanner, and so on. With a powerful SoC, a high-quality screen, and a stereo audio subsystem co-developed with AKG, the Galaxy Tab S4 will certainly attract attention of those who would like to consume content on their tablets. Meanwhile, the Galaxy Tab S4 also supports Samsung’s DeX platform that enables desktop-like experience on Android-based tablets (e.g., open up multiple windows, re-size windows, drag and drop content, etc.). Furthermore, DeX enables to attach the Galaxy Tab S4 using a USB Type-C to HDMI adapter if more screen real estate is needed. To take full advantage of DeX, users will need the optional Book Cover Keyboard that is sold separately. In addition, the Galaxy Tab S4 now fully supports Samsung’s Knox mobile security platform to protect valuable and confidential information. Tablets have always been a mixed-bag type of product for everyone. On the one hand, high-end tablets are powerful enough for productivity applications. On the other hand, most people use them to consume content rather than create anything. Consequently, many companies nowadays tend to release inexpensive tablets running cheap SoCs and targeted at children and undemanding consumers. As a result, high-end Android-based tablets have become rare birds. In fact, among big brands only Samsung and Huawei release such products. In a bid to maximize sales and address needs of demanding consumers both companies have been expanding functionality of their high-end Android tablets in a bid to make them more attractive. For example, last year Samsung started to offer its S-Pen stylus with its Galaxy Tab S3 tablets and this year Huawei followed the suite with its M5 Pro devices. Meanwhile, the addition of DeX and KnoX enables the Galaxy Tab S4 to substitute notebooks in certain cases (once equipped with a keyboard). Evidently, Samsung is bringing capabilities of its tablets closer to capabilities of laptops and Apple’s iPad Pro devices. 4K HDR screen with 845, and I'd have considered it for $650. I have a 10 inch Amazon tablet and I'd like to get a better one, yet when I look around the high end ones look like total rip offs. But yeah... iPad is so far ahead in soc power that it is not even fun to see Android maker to handicap their devices by using old technology. I think the use of the Snapdragon 835 gives an indication for how long this tablet has been in development. It could also be an indication of how many resources the tablet team is getting for development (not many). You know whats baffling, why couldn't they use their own exynos chip? It would have been much faster and not cost them as much, since its their own. I was reading it had to do with their radio (wifi) connection....but could exynos wifi be that bad?